Easy to operate panel features backlit battery and speed guage, horn button, two variable speed control buttons and power button. This panel can go on either the right or left side armrest. Comfortable seat with adjustable recline; vertically adjustable headrest; width, height and angle adjustable armrests, and standard lapbelt or optional 4-5 point harness. Rear anit-tip wheels provide an additional safe-guard in the event that the chair is operated outside of the suggested safe operating limits. 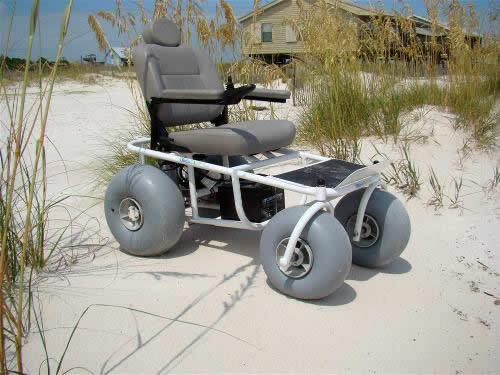 Wheeleez™ sand tires are manufactured specifically with sand and beach locations in mind.